Present to you a sensational time in its template RT Meridian. 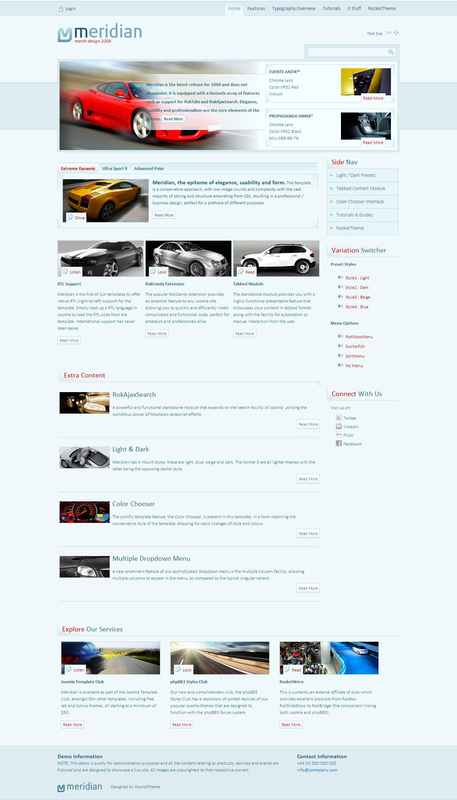 By name is difficult to determine to which category attached template, but you can see from the screenshot, it is well suited for the creation of automobile portal. Furthermore, when small alterations template theme and can adjust, on the same motorcycle. Template design is made in light bright colors, but the user is given a choice of as many as 4 different color options, you yourself will have to decide what color you like. Especially about the structure have nothing to say, it was originally two column, but you can display news, and more of the columns can be seen from the screenshot and demo template. Modules created 30 positions, it can be called an optimal amount, not much and not enough. You can also adjust the width of the pattern, the width of a specific right and left columns, font size, and so on, all this is done directly from the administration panel. Contains several different types of menus, the code is optimized for search engines and cross-browser compatibility is implemented at the highest level.